September 28th was Homecoming at BCS and our varsity football team handily defeated JPII! The Bears built a 38-0 halftime lead and cruised to a 45-0 victory in the second half. The large Homecoming crowd filled the stands and were enthusiastic in their support of the Bears. Sam Orick put on a show with his three touchdown performance; rushing for 70 yards and adding another 79 yard receiving. He also had an exciting 90 yard interception return. Blake Benton had 155 yards passing. Jonah Connor added nine points through the kicking game. Offensive linemen Zack Mack,Curtis Mack, Austin Balough, Gavin Damra, and Isaac Copeland had a big night opening big holes for the rushing attack. On October 12th the Bears took on Shiner St. Paul. 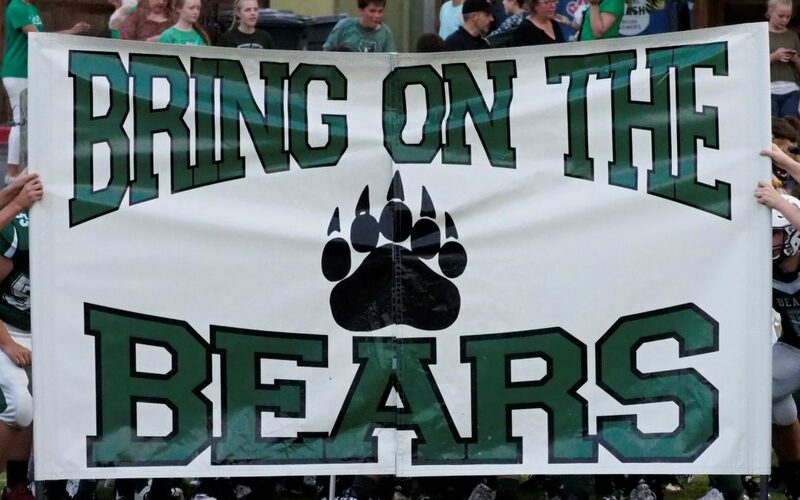 The Bears overcame numerous mistakes to win against Shiner St Paul with a score of 31 to 21. The Bears led most of the way except for a short time in the 4th quarter when the Cardinal’s scored to take the lead. One play later Sam Orick took the ball and 77 yards later the Bears were back on top. Jonah Conner gave the Bears their first lead with a 32 yard field goal. Jonah also added four extra points. Same Orick scored the rest of the points on three touchdown runs and one reception. Sam ended the night with 171 yards rushing and 89 yards receiving. Curtis Mack lead the defense with 19 tackles and Zack Mack had 10 tackles with four of those for a loss. Isaac Copeland also had 11 tackles. On October 11th the Lady Bears played against Regents. The girls fought hard and took the first set, but weren’t able to finish off the win. Caroline finished with 21 digs and Nyna had 17. On October 6th our Boys Cross Country team competed in the Founders Classical meet, and placed 2nd as a team! On October 12th the Bears Cross Country team competed in the Holy Family Invitational District meet. The Boys team scored 78 and placed 2nd. Unfortunately the girls did not have a full team. On September 29th our Lady Bears competed in the McNeil Invitational. The girls did not score but the competition was fierce, with over 600 runners! The Boys team did not get to compete due to inclement weather including lightning. The top female runner was Emma Diaz. On October 6th our Girls Cross Country team competed in the Founders Classical meet. On October 4th the BCS JV Football team played and won against Central Texas Christian. The Bears came from behind to take to lead right after halftime and did not look back. Connor Rohlack had over 100 yards rushing and 2 TDs, and Baley Cordes also had a score and some amazing runs. The offensive line did a great job making adjustments. The defense played well and forced 3 turnovers, Rylan Acheson had 2 interceptions, and Blake Christianson had 1 as well. The final score was 21-8! On September 17th our 5th/6th 4A team played against Veritas. The Lady Bears played hard but ultimately lost their first conference game. On September 24th the 5th/6th grade 4A team played their best game of the season against a very strong Holy Family team. The first game was a thriller, with Brentwood winning 28-26. Holy Family won games two and three 21-25 and 10-15. The Lady Bears were successful on 68% of their serves – a new season high. Peyton Daniel, Isis Lewis, and Peyton Gates led the way making 18 out of 20 serves! On September 29th our 7th/8th grade team competed in the McNeil Invitational. The girls placed 7 out of 23, and the boys places 23 out of 29. Renne cooper placed 25 out of 330 boys, and Lyla Kate placed 31 out of 250 girls! On October 6th our 7th/8th grade team competed in the Founders Classical meet. While no team scored, Lyla Kate placed 2nd, and Katie Pittner also placed in the top 10. On October 7th our 5th/6th grade team competed in the Founders Classic meet. Griffin Smith, Harper Counts, Eden Peterson, and Hailyn Counts placed in the top 15. On October 13th all of our middle school team 5th/6th and 7th/8th competed in the Holy Family Invitational. Both girls teams placed 1st, and the 7th/8th grade boys tied for 1st place! On October 11th our middle school tackle football team played and won against Thrall! The JH Bears Football Team got their 1st Win of the Season by beating the Thrall Tigers with a score of 32-6. Tabor Tyson had 3 rushing touchdowns of 70, 80, and 50 yards. Riley Schellenberger had 1 rushing touchdown plus a 2-point conversion run. Colton McClain had 1 rushing touchdown of 25 yards. Bryson Best led the way on Defense with numerous tackles. On October 4th our flag football team played against Round Rock Christian. The defense struggled in the first half giving up 3 touchdowns, but did much better in the second half not allowing the opposing team to score again. Gavin Martinez caught our first touchdown, a pass thrown by Colston Allen. Jack Copeland had several good catches as well. Griffin Smith drove us down the field to set up our second touchdown in the second half. Colston Allen had a big interception that gave us a chance to score, but our offense came up short. We learned not to underestimate our opponents and to never fall asleep on defense. While the boys played hard ultimately they lost 20-13. On October 11th the Bears played and won against our rivals, Hyde Park. This game was all about defense. The opposing team scored once in the first half, and once in the second half, but didn’t convert either of their extra points. Hyde Park scored first, but we kept our cool and drove down the field with Colston Allen at QB in the 1st half. He connected with Gavin Martinez for our first touchdown, and then with Victor Koncaba on the last play of the first half for a second touchdown. We convert that extra point. Gavin Martinez and Jack Fluitt did great at rush in the second half. Griffin Smith connect with Jack Copeland on a big 4th down conversion in the second half to make it harder for the other team to score as the clock ran down. Connor Schehl continues to make big flag pull plays by pursuing the ball across the field. Victor Koncaba had 1 interception. It’s a great day to be a Brentwood Bear!